Working on a monster drawing can be a challenging task. It can also be a stimulating one since you are only limited by your imagination. Indeed, a monster can virtually look like anything you want. You can choose to draw one, two or three eyes (or even more!). You can place arms in original areas. You can even draw two head and four legs if you want to! As long as you like the result, drawing a monster is a fascinating experience! 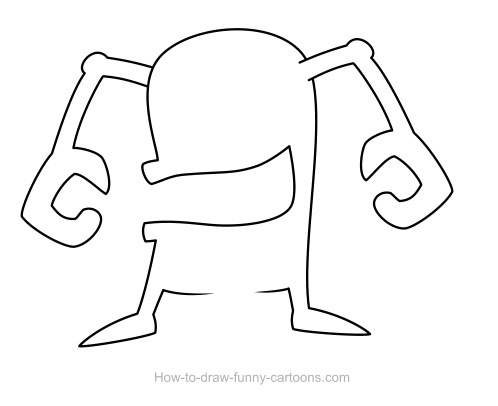 In this tutorial, I will try to create a simple character made of two arms (placed on top of the head) and gifted with a large mouth. I also like the fact that the character's body is short, if non-existent. For this step, you can either draw the character with a pencil and scan the illustration or simply sketch the monster directly in your vector application. Personally, I like to have a template to work with. Next, you can add more details like the eyes, the pupils, the teeth and the fingers. I also decided to add a large tail on the bottom of the character. This one seems more interesting with this "not very human" element. Once the illustration is completely drawn using black outlines, you can proceed to the next step. Remember that we will change the outline's color later in this tutorial, but I suggest that lines remained black for now. Great! Our goal is NOT to draw a black and white character, so let's add some color to the image. I could choose another color for the skin, but green always seems to be an obvious choice. Blue can create a friendly character and red is usually associated with the devil. 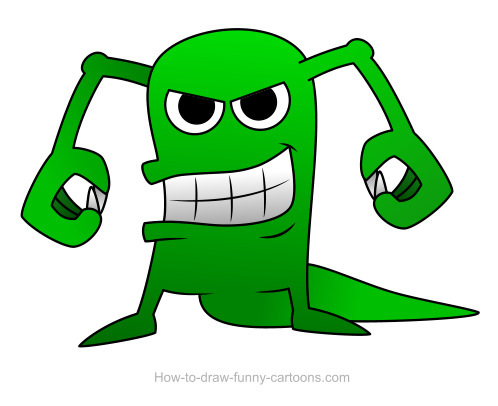 Select a bright (but not too bright) green color for the head, body, arms, legs and tail. Then, you can color the teeth in white and the pupils in black. The monster drawing seems a little dull right now, but adding some visual effects will give life to the character. If you are working with a recent vector software, you probably have access to a gradient tool. 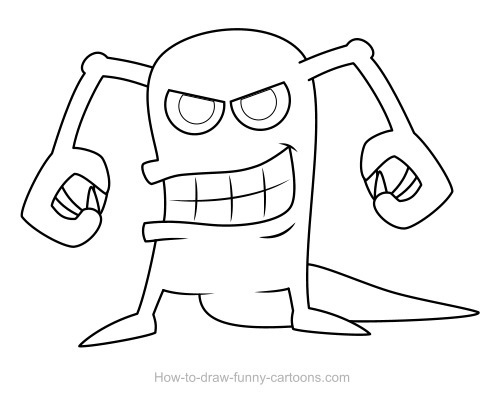 This particular tool is perfect to create dark areas on the body of the cartoon character. All you have to do is add a second color (must be the same color, but darker) to any selected shape. As you can see above, the arm on the left of the illustration is slightly darker on top. However, the arm on the right is brighter on top and darker on the bottom. Also, the body of the cartoon character is really darker on the bottom. 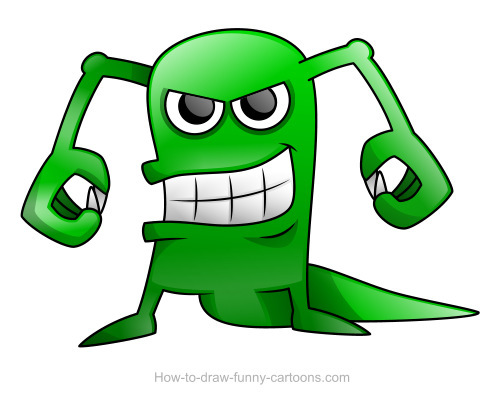 Our monster drawing now looks great, but it can be better if we take time to add more effects manually. In this step, you must add darker shapes on areas that would be hidden by other body parts or simply not affected by lighting. I also like to add a small shadow around the eyes. They are easier to see now. Of course, the tail will be partially hidden by the body and the mouth is also surrounded by a few darker areas. Shapes added previously are cool, but clearly too dark! Your vector application is probably able to play with the opacity of any solid object. It's a good idea to partially hide these dark shapes and make them more subtle. As you can see above, the illustration has more volume and the whole drawing seems more realistic, filled with more depth. Of course, I am still not satisfied and adding dark shapes is not the only thing that can be done to enhance this illustration. You can also add bright areas to simulate reflection (or areas that are directly affected by lighting). 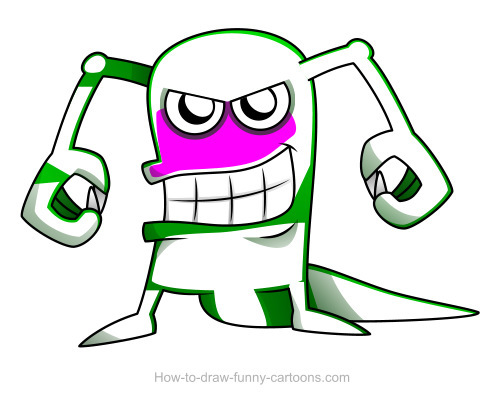 Duplicate most solid shapes on the monster drawing and change the color to white (the pink shape must be white too, but since it is white on white, I changed the color so that you could see it). You can also reduce the size of the shapes a little bit for a better result. Of course, these white shapes look ridiculous right now. You need to play with opacity once again to end up with soft and subtle shapes. See above how the character looks even more interesting now? More volume, more depth means a more realistic and visually appealing illustration. There is one more subtle change that can be made, but this simple modification can have a huge impact on the result. Remember earlier when I said that we would change the outline's color? Well it's now time to proceed! Select all lines individually and choose a color close (but darker) to the one used to fill the shape. Foe example, you can select a grey outline for the teeth and a dark green line for the body. Good! Now you can consider this illustration as being the final one! I hope you had fun working on this monster drawing. Don't hesitate to create more versions, more variations and without noticing it, you will improve your drawing abilities and give a boost to your creativity!